The unpredictable weather and spells of heavy fog had played havoc with the beginning of The European Tour’s 1,500th official event at Clube de Golf do Santo da Serra, 700 metres above sea level on the picturesque Portuguese island of Madeira. After play was abandoned on the opening day without a ball being struck, round one finally got underway at 7:45am on Friday morning, but only briefly as more fog moved in causing another suspension at 9:00am. 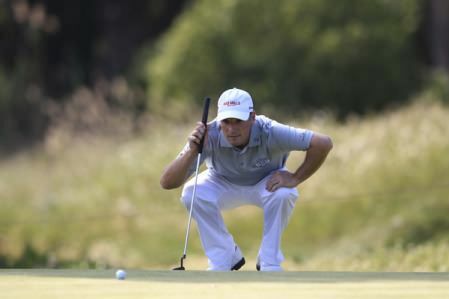 Play eventually resumed at 12:45pm and Henry came racing out of the blocks with four birdies in his opening five holes. A bogey at the 17th hole, his eighth after teeing off at the tenth, stalled his progress but he bounced back with a birdie at the 18th followed by three more at the second, third and seventh. That moved the 27 year old to seven under par but he suffered back to back bogeys at the eighth and ninth to finish on five under, two shots clear of Englishman Andrew Marshall, Pedro Oriol of Spain and former European Tour winner Martin Weigele, of Austria. Waterville's David Higgins had three birdies and three bogeys, including one on his final hole, in a level par 72 that left him tied 33rd. Ruaidhri McGee opened with three pars before play was suspended with Madeira based Dara Ford also level after two. Peter Lawrie, coming back to form with a 20th place finish last week after 11 missed cuts in a row, shot a one over 73 to be tied 67th with Lurgan's Gareth Shaw. Shaw followed a birdie at the third with bogeys at the fourth, fifth and eighth. But after an eagle three at the 16th got him back to level, he bogeyed the 18th. Mount Juliet touring professional Kevin Phelan was two over after eight holes. There's good news and bad news from Madeira. The good news is that Kevin Phelan, Gareth Maybin, Peter Lawrie and even Simon Thornton are in with a chance of winning the weather-cursed Madeira Islands Open – Portugal – BPI. Rosapenna’s Ruaidhri McGee and Mount Juliet’s Kevin Phelan share 38th on three under after opening with 69s in the rescheduled Madeira Islands Open – Portugal – BPI. David Higgins lost his full card last year because he did not take full advantage of the courses that really suited his game. But he’s determined not to make the same mistake again this season and a six under 64 in the first round of the Hong Kong Open was just the start he needed to a season that promises to be tougher than ever for the Waterville veteran. Mount Juliet's Kevin Phelan had five birdies in a 69 to share 11th spot at halfway in the Madeira Islands Open – Portugal – BPI.